Mozambique is divided into ten provinces (provincias) and one capital city (cidade capital) with the provincial status. 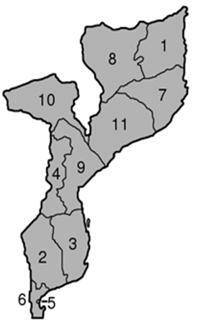 The provinces are subdivide into 129 districts (distritos ). The districts are further divide in 405 “Postos Administrativos” (Administrative Post) and then into Localidades (Localities), the lowest geographical level of the central state administration. Since 1993, 33 “Municipios”, (Municipalities) have been created in Mozambique. The north central province of Zambezia and Nampula are the most populous. Maputo Province (Map 5;6): Mozambique's capital city is called Maputo (previously known as Delagoa Bay - Baía do Espírito Santo). It shares borders with South Africa and Swaziland and is very accessible not only by road via South Africa and Swaziland but by Air and Rail. The city became firmly established when the central authority was transferred here in 1898, it was also a major outlet for the gold fields of South Africa especially once a railway line was constructed. Prior to the 1970s and 1980s, Maputo was one of the most glamorous places to be in Africa where a mix of Portuguese and African culture attracted visitors from all over the world who wanted to enjoy freedom with beauty and fun rolled into one place. It was and is a beautiful and exotic destination with an impressive skyline. Neglect set in during the war years and the city fell into disrepair. In the last few years renovation works, new developments have started that marks the beginning of a new era. Maputo has lilac jacaranda trees, lined avenues, a variety of interesting historical and scenic spots, local restaurants serve wonderful fresh seafood and cold beer with cuisines from all over the world while enjoying the beauty of the Bay . The Bay of Maputo, together with the river Incomati and Maputo define the limits of the capital. Xefina Island, the Old prison Island holds deep stories and can be viewed clearly from the shore. The bay has a long beach that does get busy in the summer but is ideal for collecting pansy shells or walking your dogs. Maputo has exploded with boutiques, art shops and boasts modern shopping centres such as Game, MBS, Polana Shopping centres and much more. Other attractions of this Mozambican province is Inhaca Island - popular for diving and snorkelling, and ofcourse Portuguese Island that rest off Inhaca Island and is a maginificant unspoilt paradise. Snorkelling is a must or a walk to the in land lagoons to cool off is a memorable experience. Further south is the Maputo Elephant Reserve, and about a 2 hour drive in 4x4 only from Maputo is Ponta do Ouro a very popular diving and snorkelling spot with beautiful beaches. The beaches near “Ponte” the abbreviated name host some of the top lodges visited by royalty and top celebrities. Marine life is rich with tropical fish, and dolphins which can be viewed and if you join the dolphin expeditions can swim with them. There are many historic landmarks to see in Maputo and a good place to start is the Praca de Independencia, also worth visiting are the Central Railway Station, Tunduru Gardens, the Art Museum and the Museum of the Revolution. Sofala Province (Map 9) situated in the lower-middle section of the country, it is one of the wealthiest in Mozambique and produces mainly sugar and shrimps. It is named after the ruined port of Sofala, which was founded in the ninth century and depended on the East African gold trade.The Province offers game viewing and fabulous scenery at the famous Gorongosa National Park, which is 150km (93 miles) from Beira - Elephant, Lion, Buffalo and other animals, can be seen here, birdlife is spectacular. There is also the Marromeu Buffalo Reserve in the north of the province. An active programme for the re-stocking of animals is underway in both of these areas. Beira the capital city of Sofala stands at the mouth of the Pungwe River, the ground is swampy and the weather is very hot and humid stringent malaria precautions must be taken before visiting. Beira is the second largest city in Mozambique. It also provides Zimbabwe with direct coastal connections by road and rail via the Beira Corridor. The busy port city has interesting architecture and old buildings, banks, hotels, shops, cosmopolitan cafes and restaurants large juicy prawns and cheap crayfish available here is still some of the best. Excellent beaches are found between the Clube Nutico and the lighthouse. Macuti beach is the most fashionable suburb. About 10 minutes inland there is a resort and artificial lagoon with islands, visitors can swim and hire pedal boats, dhow trips and great camping can be found on the Save River. Cabo Delgado (Map1) is the north-eastern province of Mozambique. Translating approximately as Cape Thin, the province is bordered by Tanzania to the north, the Indian Ocean to the east, Mozambique's Nampula province to the south and its Niassa province to the west. Although Pemba receives a fair amount of tourism, most of which arrives by air, Cabo Delgado is one of the least visited provinces in Mozambique. Despite this, it has an impressive array of attractions, most of which are along or just off its approximately 300km ofcoastline. The Makua are the main ethnic group of the Cabo Delgado province and Makonde are known as artists, particularly for their wood and ivory carvings. The city of Pemba, located on the large bay of the same Pemba, has little industrial activity and thus its natural beauty has been preserved and its beautiful beaches are untouched by pollution e.g. Praia do Wimbe is a palm-lined beach with white sand and blue clear waters. The old town contains several traditional markets where you can admire the silversmiths at work on their verandas. These craftsmen transform coins into silver necklaces, bracelets and ear-rings. If you walk around Pemba you'll notice the local women walking around with white paste on their face. This is nothing more than a skin-softening mask just like those worn by Western women. The only difference is that Makua women don't hide theirs and have become well known for this practice. Ibo Island is a beautiful island and part of the idyllic Quirimbas Archipelago. In historic times, it was an important Portuguese trade post. To visit the island you can hire a boat in Pemba for the crossing. Gaza (Map 2) is one of the most remote and inaccessible (and dry) parts of Mozambique, with relatively little to offer tourists beyond its short coastline. It is known as the "granary" of Mozambique because of the fertility of the Limpopo valley where there is extensive cereal and rice cultivation. Portuguese is the most prevalent official language in Gaza, an inheritance from the country's colonial past, but most of the region's population cannot read nor speak it. The capital city, Xai-Xai (pronounced "shy-shy") is the greatest attraction, due to it’s lovely beaches. Located just 224 km from Maputo and the nearby beach (10km) is a popular tourist destination. There are several Hotels and restaurants in the town, however, the majority of tourists prefer to stay at the beach, Praia do Xai Xai. It is a place for holidays or simply for relaxing weekends as it offers well equipped tourist complexes. About 145 km north of Maputo (EN 1) is the small town of Macia which is the turning for Bilene, some 30 km further. Bilene lies on the shore of a huge, 27km long lagoon of clear, brackish water and fine, white sand. Further attraction is The Banhine National Park, situated between the Limpopo and Changane rivers, is an important area, protected due to its rich variety of wildlife. The Inhambane is the most developed Province of Mozambique in terms of the tourism industry and its characterised extensive of coconut palms and cashew trees. It is considered as perhaps one of the best quality tourist region in Mozambique. The towns of Vilanculo and Inhambane are beautiful and alluring, and the most popular tourist destinations in Inhambane Province. History is ubiquitous with the Cathedral of Our Lady of the Conception which is an old and imposing church in the town of Inhambane, with a fine clock tower which was built by the Portuguese about 200 years ago. There are various luxurious hotels on the islands, and to reach the islands it is possible to hire a boat locally, or to travel by air from Maputo and Beira or to fly directly from a neighbouring country via Vilanculos where there are immigration and customs services. This province has innumerable famous beaches, amongst which are: Praia de Zavala (11 km from Quissico), Praia de Závora (85 km south of Inhambane), Baía dos Cocos (Coconut Bay) and Praia do Tofo (22 km east of Inhambane), Praia da Barra (20 km north of Inhambane) and Pomene (174 km north of Inhambane). This province has one of the most famous tourist destinations of the country; the Bazaruto archipelago. The Bazaruto Archipelago consists of four islands (Bazaruto, Benguera, Magaruque and Santa Carolina). They are situated off mainland between Vilanculosand Inhassoro (780 km from Maputo). Apart from the excellent beaches stretching all along the cost, and the famous tourist destination the Archipelago of Bazaruto, the interior holds natural parks where various species of wildlife can be observed. Zinave National Park and Bazaruto National Park are conservation areas. Nampula Province (Map 7) was officially called Moçambique during the days of Portuguese colonial rule. When the country gained independence, Mozambique was adopted as its new name and so the province was renamed after its capital, Nampula. This province is located in the upper regions of Mozambique with rugged mountains and Miombo forest. The capital city, also named Nampula, is located inland on the plains near Mozambique Islands that have popular beaches and was the Capital of Portuguese East Africa but only until 1898. After that the capital was moved to Lourenzo Marques, now Maputo. The Province of Nampula has some of the most surprisingly beautiful landscapes in the country. Among the places of interest are the Port of Nacala, one of the most important in Africa. Mozambique Island has a long and fascinating history that is so important and incredible that so many people are unaware of its history in slave trade, trade in spices and gold for hundreds of years, the older section was declared a World Heritage Site in 1992. Here there are buildings constructed out of coral though now not as pristine as they once were - places of interest include: St. Pauls Palace, The Museum of Sacred Art and also The Fortress of St Sebastian. This is the third largest town in Mozambique and is quite modern with banks, hotels, tennis clubs, supermarkets and shops. Although not really a designated tourist area there are a lot of places that are worth a visit like a museum, mosques and interesting cathedrals such as the imposing Cathedral de Nosa Senhora da Conceicao. This fascinating and picturesque island with its heterogeneous cultural heritage is a World Heritage Site (UNESCO). One could say it is a unique jewel registered in the navigational routes of the Indian Ocean. During the last few hundred years it had been a thriving trading settlement dealing in slaves, gold and ivory. At different periods in time the island has been the bastion of conquerors, a pirate’s paradise, an important boat-building centre, a religious and missionary centre (for a variety of creeds), and an administrative capital, with palaces and offices. It had the prestigious position as the capital of Portuguese East Africa, and as you see it today, is the accumulation of cultural influences assimilated over the centuries. On route to India, Vasco da Gama was one of the first Europeans to write his findings on his travels which took him to Mozambique first in 1498 and then later in 1502. An extract taken from Vasco da Gama’s diary gave a rather clear explanation to where Ilha de Moçambique was to be found…”Moçambique Island lies in a wide bay which is partly sheltered by two islets 3 miles to seaward, which Vasco da Gama named São Jorge. By 1538 the southern isle was called São Tiago. The 19th century charts showed São Jorge as Ilha de Goa and the southern one as Ilha de Sena “. Situated in the Nampula province, to the south of Mossuril and Nacala, the Ilha is approx. 1½ miles long , in latitude 15º 02’S, and is made up of the Stone town (north) – originally coral and limestone and the Makuti area (South) – houses made out of mainly reed. This area supports approx 7000 to 10 000 people. To reach this treasure island you would have to fly first to Nampula, and then from there you drive to the Ilha. Driving from Nampula takes approx 2.5 hours in the direction of Nacala, Go past Namialo and towards Monapo, turn right to Lumbo (airstrip) and onto the Ilha (which is connected to the mainland by a 3.5km bridge). In the event you take a bus from Nampula, you would find them at Av. Filipe Samuel Magaia and Avenida do Trabalho, here the buses leave around 4:30 am and stops at Monapo before arriving at the Ilha. A bridge has linked the island to the mainland since 1967. Mozambique’s maritime trade was transferred to Nacala. The extension of the railway from Lumbo to Nampula took place and Nampula city was designated as the new district capital in 1933. Ilha de Moçambique slowly faded into dilapidated beauty. Ilha de Moçambique district is divided into two localities; Ilha de Moçambique locality and Lumbo locality. The Ilha locality consists of the Moçambique Island itself together with three smaller islands, St Lourenco, the island of Goa (or S.Jorge) and the island of Sena (or S. Tiago). The names of the two latter islands originate from the course taken by sailing ships when they left the Ilha on their way to Goa or Sena Lumbo. Dates back to 1557, built by Diogo De Sousa by order of King João III. Fort of São Sebastião had four bulwarks with a large battery of cannons. This fortress if only it could speak, it would tell of how the Dutch Navy in 1607 tried to capture the fort even though they had control of the Island, they left and returned a year later with 13 ships, yet again they did not succeed. In 1618 the captain was stabbed fatally, and in 1671 an Omani attack was also unsuccessful. The chapel of our Lady of the Bastion was built in 1522, just on the outside of the fortress. It is the oldest European building/chapel in the southern hemisphere in Manuelino architecture with small crucifix shaped windows in the nave. The Chapel of our Lady of the Bulwark is at the far end of the Fortress of St. Sebastian, facing the channel, on the spot where formerly there was built a Bulwark made up of three parts. Building dates to 1635. Here you can view 17th century sculptures of Santa Isabel, Queen of Portugal and St. Francis, chalices. Eighteen century pieces of St. Anne and the Virgin, an old wooden image – 5 cm high, of the apostle of the Indies. A religious sculpture of St. Francis, its origin is unknown, although it is attributed, according to the greatest probability, to the Capuchin Fathers who have founded the church of Our Lady of Good Health a Maconde Christ. Richard Fanshawe was the first to render the Lusiedas into English, in 1655. Stanzas from Canto 5 were taken from the “Diary of Vasco Da Gama” throughout African Waters, by Eric Axelson & Stephan Phillips. This church was founded in 1633 and was renovated in around 1801 this graveyard is remarkable as there are tombstones marking Christians, Muslims and Hindu’s. There were/are no fresh water wells on the island (in some of the older homes and warehouses you will find a sophisticated rain collection systems that collected rain water and deposited into underground tanks). There is a swimming pool size one based under the Fort of São Sebastião. Water at present is supplied via a pipe sent in from the mainland. Mussiro: a white cream extracted from a root, women use on their faces to clear blemishes, soften skin and beautify. It should be noted that Mussiro was used for medicinal purposes previously and the colour white does have significant meaning. You have often seen pictures of these women with painted faces that are almost becoming a trade mark of this area. *In the different books I have seen it written as Muciro of Makua women or Mussiro or even Mcirro. In the Lonely planet they have mentioned that it is taken from a branch of the Olax Dissitiflora tree, known as Ximbuti or Msiro, and then ground with water. Tufo: A brilliant ethnic energetic dance with Islamic influences, performed by women and girls. The original name of the Ilha is derived from, (some say the Ilha was called Muipiti), a Muslim Sheikh, MOUSSA BEN MBIKI. 5km east of the Ilha is Goa Island with a lighthouse, 2km south of Goa Island is Sena Island or Ilha das Cobras. Manica (Map 4) is one of Mozambique's ten provinces. The province is an important producer of a wide range of fruits and vegetables. It's a narrow strip on the western side of the country, just south of the curiously positioned Tete Province, which pokes northwest from the main stretch of the Mozambique. Although not of great interest to travellers, the inland Manica Province and its coastal adjacent Sofala Province are of great strategic and historical importance to Mozambique. They are connected by the Beira corridor between Mutare in Zimbabwe and the port of Beira on the Indian Ocean, which was important to the Swahili gold trade in medieval times and continues to be important to modern trade. Chimoio, the capital city of Manica Province, is an important commercial centre for the trade of agricultural products which comes in from the surrounding fertile areas. Cabeça do Velho (Face of the Old Man) - the most well known feature of the city is a spectacular natural stone formation resembling the face of an old man. Chicamba Real is a hydroelectric dam between Manica and Chimoio. It is uniquely situated with the sheared off rock forming a natural V-shape to house the dam. About 45 km from Chimoio towards the Machipanda border there is a sign for Casa Msika, a tourist resort on the edge of Lake Chicamba with chalets, a campsite and a pool. This is the ideal place for a fisherman or an ardent bird watcher. Visitors are also invited to visit the crocodile farm nearby. of the massive Cabora Bassa dam, and has a wealth of mineral reserves including gold, iron, coal and fluorite. Tete Province receives many travelers, but this is due more to its strategic location than its charms. Aside from Tete, the province's eponymous capital and arguably the hottest town in Mozambique, sits the old Boroma church mission, probably Tete's most interesting feature. The dam is Africa's second largest freshwater lake and has the biggest hydroelectric scheme in the Southern part of this continent. Only Egypt's Aswan Dam is larger in surface area. Written permission is required to visit the dam and can be obtained in the town of Tete before the 150km (93 miles) trip. There are guided tours of the dam and its workings. A wonder of modern engineering, the dam creates an artificial lake with enormous potential for fishing, and tourism, water storage and irrigation, apart from being Africa’s largest supplier of hydro-electrical energy. The capital city of this Mozambican province is located on a plateau on the Zambezi River, about 500 metres above sea level. The 1km (just under a mile) long Tete Suspension Bridge crosses the Zambezi River and is a vital connection on the major highway linking northern and southern parts of Mozambique, Zimbabwe and Malawi. The River Zambezi also brings this region a wealth of wild animals, which can be along its banks. Zambezia Province (Map 11) is located in the upper-middle section of Mozambique this province has a wide variety of landscape from extensive palm groves to a wonderful tea plantation. The Chuabo and Macua are the main enthic groups in this region. Zambezia is also a prodigy of wild fauna, with a great variety of species to be found all over the province, while sheer beauty of its flora varies between the tropical and the temperate, as one goes from coastline towards the interior. Zambezia has a rich soil and subsoil, producing fertile lands for the production of rice, cashew and the famous pineapple. The port capital is Quelimane. In under an hour north-east from the town on tarred roads visitors can find the lovely beach of Praia de Zalala. Edged with shady casuarinas trees and endless white sand that makes this destination remote but a very popular holiday area. The tea plantations are in the mountainous northern part of the province. A variety of animals can be seen at the Gile Game Reserve which is a wildlife conservation area. Quelimane the capital of Zambezia is an important port on a wide river called Rios dos Boas Sinais, so named by Vasco Da Gama late in the 1400s. There are a number of restaurants, trendy street cafes and hotels on the river front. Like most of northern Mozambique the Quelimane is largely Islamic and mosques can be found dotted around the city. Interesting sights include the Old Cathedral dating from 1785 and the Governors residence. Niassa Province (Map 8) is the most sparsely populated province in Mozambique with only 900, 000 people inhabiting its 129,056 km² area. Located in the north of the country bordering Tanzania at the Rovuma River and Malawi in the west at Lake Niassa (Lake Malawi), it is the largest of all the provinces of Mozambique. This area is one of the wildest and least developed. In the north of the province is the massive Niassa Reserve, the biggest in southern Africa, it is game rich and famous for the large number of Elephant found there. Lake Niassa is above all a great waterway where people from all around the region communicate and earn their daily bread. The Mozambican shores of Lake Niassa are cut out with the most fabulous shape imaginable, little Islands and mini-bays. The welcoming fresh water of lake Niassa invites the visitors for a relaxing ride on the calm, present days which the climate offers most of the year round. A visit to the stunning Lake Niassa is a must, the road down to the lake is only possible with 4x4 vehicles and so this area has remained unspoilt. The main urban centre is Lichinga. On the plain of the same name in the western part of the Province not far from Lake Niassa. The main Ethnic groups are the Macua, Nyanja and Yao.